a 9-month transformational experience to become Spirit-filled disciples, living on mission with Jesus. At Vinelife, we are joining God’s vision to see the whole world awakened to the fullness of life in Christ. We want to see every man, woman, and child come into the saving knowledge of Jesus and be equipped to live out their unique God-given calling on earth. That’s revival! Jesus simply asks us to do what he did – make disciples. While ministry programs, conferences, classes, small groups, and church services are good and necessary, we’ve found that in an of themselves, they don’t necessarily make mature disciples. So how did Jesus bring transformation into the lives of people around him? What did he mean when he said “Go and make disciples”? And how is THIS any different than any other church program? How can I bridge the gap between what I KNOW with my head and what I DO in my life? Some adopt a “try harder” approach, appealing to the will to fix what’s wrong. We think we can bridge the gap by relying on behavior modification. Some adopt a “get smarter” approach, appealing to the intellect. We think we can bridge the gap by relying on better teaching. Some adopt a “get zapped!” approach, appealing to the emotions. We think we can bridge the gap by relying on supernatural experiences. But here’s what we find: these strategies are massively important, but long-term they do not always produce mature, powerful disciples of Jesus. They don’t train us to trust Jesus. Instead, they habituate us into moralism, intellectualism, or a chasing after ecstatic experiences. We call this the WAY, and we need to be able to see it and name it if we’re going to be transformed. 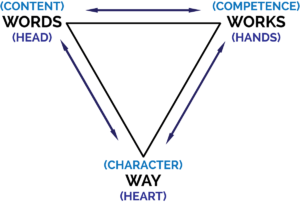 From the anchor point of the WAY of Jesus, we can begin to integrate WORDS and WORKS into a holistic model of transformative leadership that trains us to lead like Jesus, live on mission, and make disciples. The right thing done for the right reason in the right way. Empowered to live on mission with Jesus. 75 minutes per week to participate in the video call. Another 30-60 minutes during the week for reading & assignments, on average. If you plan to participate sporadically and hope that you’ll experience the transformation by osmosis or something, do not sign up. We pray you’ll consider joining as we seek to become Spirit-filled disciples, making disciples in the nations of the earth!